iOS is a mobile operating system created and developed by Apple Inc. and distributed exclusively for Apple Devices. We commonly face the basic question that Where to start when building an app? AxisTechnolabs will be there for your each query which you face. We strive to create iOS Apps That adds Real Value to your business. Why AxisTechnolabs for iOS App Development? 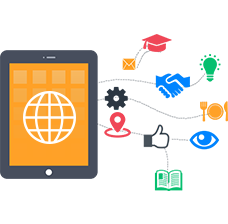 AxisTechnolabs is a prominent iOS App Development Company. We are working towards developing latest and updated version of iOS Application to meet the users need. We Design, Develop and Optimize Native Desktop and mobile applications for iOS. Our developers are here to help you with data security and app distribution. We Provide you Guaranteed approval of your app on the app store and complete security of your source code. AxisTechnolabs is leading iOS development company in Ahmedabad and we provide this services world wide. Should You build an iOS app with AxisTechnolabs? When you have a idea for build a iOS app, it can be tempting to shoot out of the gate and build app for device that exists - iPad, iPhone, Android, etc. AxisTechnolabs working on solid iOS experience. Nowadays, Smart phones have become a part of life. There are huge advantages in business with use of smart phone, so their usage is increasing demand. iOS app development is essential to understand the advantage of having such application for your business, that's Represent a brand and it's reputation. AxisTechnolabs efficiently understand the business requirement of clients and transform into a best working application. Our main priority is client's satisfaction. Easy integration & migration of apps to iPhone 6 and Below Version. Status Report update to client within deadline. Ongoing Support after App live. At Axis Technolabs, we are 100% committed to develop apps that make your ideas alive and best meet your business needs. Our talented and experienced iOS developers think out-of-the-box to help you stand out in the marketplace. We also thrive on latest tools and technologies that enable us to meet promised deadlines and deliverables we can be always proud of.